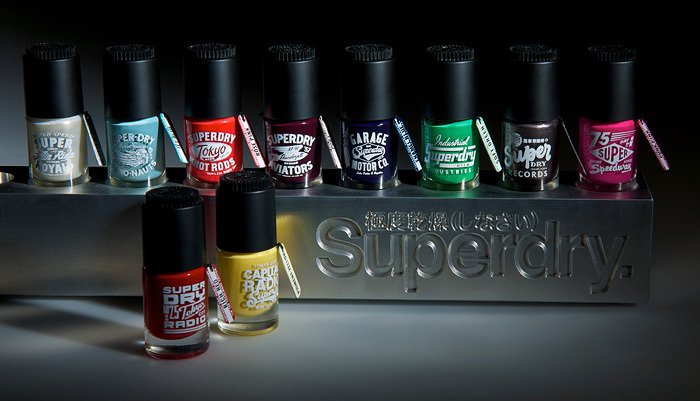 Available from next March, cult British clothing brand Superdry will launch a range of 10 nail polishes. Superdry Nail Paint will include the colours: Chalk, Pigment Yellow, Port, Charcoal, Rich Red, Soft Green, Enamel Blue, Jet Blue, Rose Pink and Punk Pink. Each bottle carries designs reminiscent of the brand’s iconic pseudo-japanese tees and will retail at £6 each. I can’t wait to get my hands on these, I love the look of that green… and the pale blue… and the… oh ok, I want to try them all. Are you digging the bottle design as much as me?